The mounting industry does not have an official standard but the AMPS pattern might be as close as you can get (at least for small electronics). The AMPS pattern is a series of four holes aligned in a rectangular pattern. Some manufacturers use two of the four holes while maintaining the standard pattern spacing dimensions. Manufacturers that have mounts that align to this pattern are Bracketron, RAM, Arkon and Pro-clip. There are many others as well. We see this pattern being used mostly for small electronics. As you get into larger devices such as displays and televisions, the AMPS pattern is simply too small. here you begin to use a completely different mounting standard called VESA. 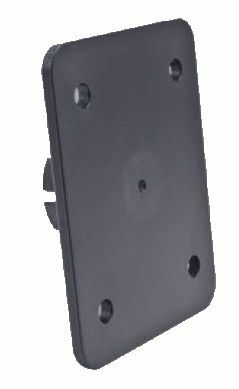 VESA has several different types such as 75×75 and 100×100 meaning the holes are spaces 75mm or 100mm apart. The AMPS pattern consists of four holes in a rectangular pattern spaced 1.188 inches by 1.813 inches. Some manufacturers also have 2-hole adapters that support the diagonal measurement of 1.912 inches. This mounting design pattern is fairly well-known in the HAM Radio industry where many head plates use that 4-hole pattern. We find that HAM Radio enthusiasts are pretty handy people and where the AMPS pattern doesn’t exist, they don’t mind drilling some holes to match up. Another common AMPS compliant area is satellite radio. Before the big merger in the satellite radio industry, XM Radio never used this pattern, instead opting for a T adapter. Sirius has always used this 4-hole pattern. After the merger, guess which pattern won? Now, almost all of the recently introduced radio cradles have the 4-hole pattern on the back. Certain manufacturers like RAM have made almost all of their custom cradles AMPS compliant and use a series of compliant adapters to attach it to their ball and socket mounts. We are even seeing many of not all of the heavy-duty motorcycle GPS units using this pattern. Hopefully we will see further standardization of the use of this pattern as sure would make mounting stuff a heck of a lot easier. If you would like to read about mounts that feature the AMPS pattern, you can read it here.